The conventional wisdom holds that athletic directors are hiring younger and younger basketball coaches with each passing year. Certainly Brad Stevens and Shaka Smart showed what can happen when you hand the reins to an up-and-comer, right? And following in this same wake we now see precocious youngsters like Richard Pitino (head coach of Minnesota at the tender age of 31), Brandon Miller (Butler, 34), and even a familiar character like Josh Pastner (who, after all, is still just 36). Verily, it is said, tomorrow belongs to these social-media-savvy cool guys. They “relate” to today’s recruits. They jump on the practice court and ball with their players. They blog. They tweet. Those may indeed be good qualities for a coach to have, but it turns out the texting hipsters you’ve been hearing about are exceptions to an increasingly geriatric rule. If anything this is the golden age of geezers. There’s never been a better time to be a really old coach. Last April, Texas Tech hired 61-year-old Tubby Smith. In 2012, Miami hired 61-year-old Jim Larranaga to replace a coach, Frank Haith, who was just 38 when he was hired by the Hurricanes. Also in 2012, SMU hired 71-year-old Larry Brown to replace a coach, Matt Doherty, who was just 44 when he was hired by the Mustangs. In 2011, Oklahoma hired 58-year-old Lon Kruger to replace a coach, Jeff Capel, who was just 31 when he was hired by the Sooners. And in 2008, California hired 61-year-old Mike Montgomery to replace a coach, Ben Braun, who was just 43 when he was hired by the Golden Bears. All of these coaches had reached the Final Four before they were hired into their current gigs, and two of them (Smith and Brown) had won national titles. In effect, five struggling programs hired these Modern Maturity subscribers in an attempt to bask in that refracted glory. 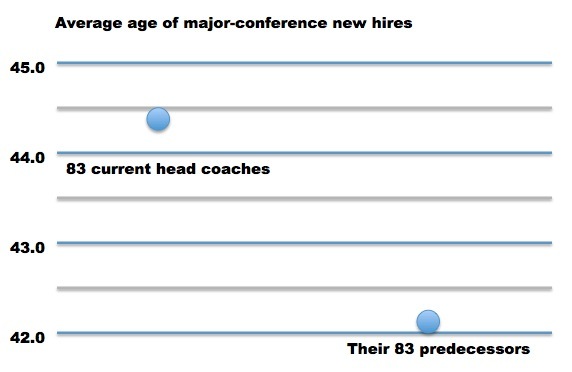 And, as actuarial tables would lead one to expect, these coaches were without exception replacing incumbents who on their hiring days had been much younger than the new guys were on theirs. This same dynamic can also hold true at non-struggling programs. Even Butler’s Miller, to take one youthful example, was older on the day he was hired (34) than his predecessor, Brad Stevens, was on his first day (30). By the same token it’s exceedingly likely that when the time comes for Duke and Syracuse to replace their legends, the new coaches will be older than Mike Krzyzewski (33) or Jim Boeheim (31) were when they were hired. As these examples make clear, not every program is trending younger in its hires. Maybe we’d see more of a Shaka-effect at the mid-major level, but the 83 major-conference head coaches in place today were, on average, 44.4 years old on the day they were introduced to the press. Conversely, their predecessors were a mere 42.2 years old as new hires. Basically Richard Pitino’s an outlier, but he’s not unprecedented. Young coaches have always comprised a relatively small but highly visible share of all major-conference hires: Billy Donovan was 30 when Florida came calling; Matt Painter was 33 when he was installed as Gene Keady’s heir apparent. What’s changed more recently, however, has been the increasing willingness of programs to recruit Final Four veterans from the 60-plus crowd. Texas Tech was an early adopter here with its hiring of Bob Knight in 2001. (They just keep going back to that same well in Lubbock, don’t they?) It’s been this influx of experienced job applicants that’s landed us where we are today: Rookie head coaches in the major conferences are older than they used to be, not younger. Forget texts. Assuming this trend continues, we’ll soon see a day when blue-chip recruits are deluged with telegrams from Western Union. Correction: Larry Brown was 71 when hired by SMU, not 61 as originally stated here. “Golden age of geezers” indeed. This entry was posted in hoops, HR for athletic directors on October 17, 2013 by johngasaway.